We have been asked why we started doing colors on bars with a unusual 31.8mm track bar, instead of going with one of our established designs. We really didn't have a good answer for them. 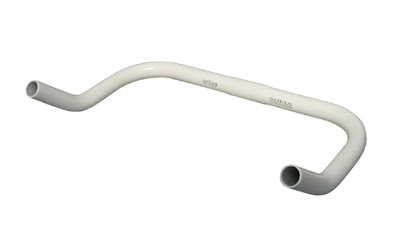 Instead we decided to add a few colors to our Urban Pursuit bull horn bar -- Powder coat white, red and gold. Only in 38 to 42cm for now. We have no immediate plans to color any other of our bars. We don't want to get you all sick on too much eye candy. 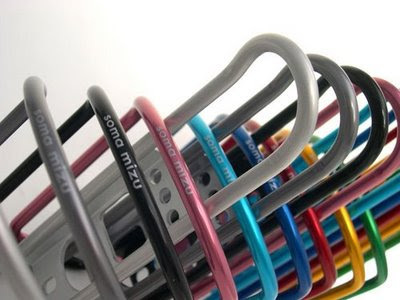 Frankly some of us get a little nuts already when we see the mass of multi-hued bars in our warehouse shelves. The left eye starts to twitch first usually. Unless we are looking at gold, then it starts with the right eye. Then we start humming tunes from the Willie Wonka movie (the original one.) But as long as people find these offerings adding joy to their bicycle lifestyle, we will learn to live with it. Today the oompa loompas delivered these new bottle cages. What's so special about them besides the colors? We found a excellent manufacturer in Japan instead going to China. There was a time when cyclists all either wanted an American-made Blackburn cage and Japanese-made cage, because a cage made anywhere else was crapola. We just want to appeal to those who want something a little better, perhaps a little more special. - We call it the Mizu. Mizu simply means "water" in Japanese. - It features extra mounting holes to allow you to mount the cage straight or slightly canted left or right, just in case you find that more ergonomic. - Aircraft grade aluminum of course. - In black, white(not shown), silver, gun metal, pink, ice blue, dark blue, red, amber gold, and green. These should be in stores early spring. 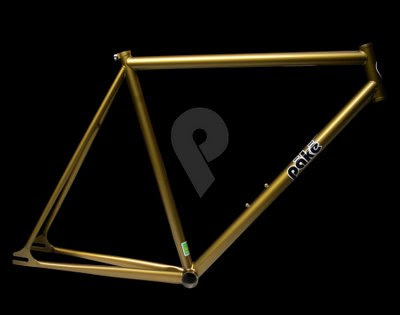 Pake Bikes just posted this pic on their website today. It is a new limited run color they are calling 'Dirty Gold'. Looks beautiful. The Soma Fab Shop wasn't able to get any of their last limited edition run. They gave priority to brick and mortar shops, which we are cool with. We won't be anywhere ourselves without our dealers. But this is so gorgeous. C'mon buds. Hook us up. For those who have been waiting for Soma Rush's to come back in stock we expect the first batch of the year in less than 2 weeks. Maybe one of you might know what movie that "chant" comes from. 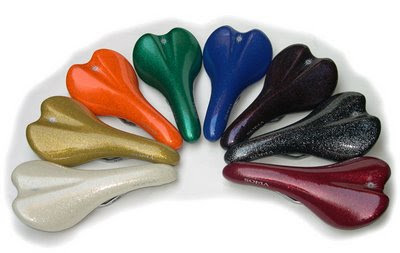 Coming next week will be these limited edition glitter vinyl versions of the Soma Ensho Saddles. Colors from 8 o'clock to 4 o'clock: White, Gold, Orange, Green, Blue, Purple(black with purple glitter), Black (black w/silver glitter), Red. We really mean limited edition. We only have 50 per color. And our factory does not intend to re-order this material. A few months ago we said we were working on getting Honjo Brass Fenders. We still haven't gotten them, but we did find these beauties from another Japanese outfit named Tanaka. They only offer smooth finish....no hammered or beveled. They require custom fitting...meaning you get to drill the holes exactly where you want them to go. Stainless steel and aluminum versions available as well. Not badly priced at $59.99. The brass will set you back about $100.